Marc Stabel introduces, in his words, "a rather unfamiliar species" of auchenipterid. It is scientifically known as Pseudauchenipterus nodosus, also, rather intriguingly, known as the coco soda catfish and while something of a rarity, is well worth keeping an eye out for as Marc explains. These woodcats can be found in the lower reaches of rivers and into estuaries from Venezuela to Brazil, which is quite a distribution and makes one wonder why it is hardly imported. It could also be that the countries where it is found hardly ever export fishes or — in the case of Brazil — that the distribution area is simply too far away from Manaus, to name one well known export centre. The first and only time I saw this species for sale was back in 1987. In those days the UK was already well known to us with regard to catfishes but simply out of reach and our Dutch shops mainly sold mainstream fishes so the place to be was Germany. Our favourite shop back then was Blecha in Witten-Stockum near Dortmund. Although quite a trip — it is some 150 kilometres from Eindhoven — the Blecha shop is always worth a visit. On an earlier occasion I had already found my first pair of Tatia intermedia over there and — much later — I came across the still undescribed Auchenipteridae sp. Guyana, which I still keep at present. One day we encountered a fair bunch of small auchenipterids that were sold under their correct scientific name. However, that didn't ring any bells. Mind you, I had very few catfish books in those days (even in the books I own today Pseudauchenipterus nodosus is an uncommon entry) and there was no such thing as the internet. Although highly interested, I didn't dare to buy any for they were simply too small to put in my tank. I surely didn't want them to end up as food, nor did I have an extra tank to spare. Luckily a friend bought some and we made an arrangement that if they were going to outgrow his tank I would take them from him. That scenario didn't work out because they refused to eat and all specimens died rather quickly. About four months later we went back to the shop and I intended to buy some P. nodosus provided they were still there. Maybe all had died from starvation. Many were gone indeed (I never dared to ask a LFS owner whether his fish were sold or had died; besides, they're always sold of course), but the few specimens that were left certainly fed for they had grown significantly. I can't remember how much they cost, but I could afford three which turned out to be one male and two females later on. I've kept these specimens for about three years in which the females grew to about 18 centimetres TL. When I decided to stop keeping auchenipterids, I sold all my woodcats to a wholesaler where they were pictured on arrival. A fair number of these were used in Mergus Atlas part 5. The picture of Pseudauchenipterus nodosus however, which is shown at the top of this page, isn't included so far. All woodcats found a new home eventually. Most of them went to Germany. Pseudauchenipterus nodosus is a slender species. Juveniles show a speckled pattern with a white belly and some black in the tail. Adolescents and adults show a blue grey body colour and their tails are jet black. Mees (Zoologische Verhandelingen No. 132, 1974) states the colour of the tail fades or even disappears as the fish grows larger but I can't confirm this as the caudal fins of my 18 centimetres specimens remained black. Others fins remain more or less transparent. The lateral line is zigzagged and above it about 8 to 10 vertical rows of small white spots can be seen in larger specimens. The snout is very rounded with a terminal mouth. Their barbels are relatively long for an auchenipterid and the maxillary barbels are pointed sideways while searching for food. All prepared and frozen foods are greedily taken. Juveniles take their food from the bottom, whereas adolescents and adults obtain theirs mainly from the surface. This species will not harass other fishes, but it is a strong competitor for food. Not only because of its appetite, but also because it is the most diurnal auchenipterid I ever came across. This is a very day active fish which isn't in the least bothered by lights. This implicates that an aquarium should have plenty of swimming space and some hiding places (instead of the other way round which one would expect with auchenipterids). Because of its visibility it may become an easy target for any aggressive fish. I strongly recommend not combining them with such fishes. Also, avoid fishes that are too small and risk being eaten by 'accident'. In the wild they live in large shoals so a group is preferred, but my 3 specimens were perfectly fine amongst themselves. Noticeable is also that this species is adapted to life in brackish water (presumably even salt water) but does very well in fresh water too. A strong current is recommended: they can constantly be seen hanging into it trying to grab some food. Being a true auchenipterid, sexing is rather easy: adult males have a genital papilla for internal fertilization, are much more slender than females and have a slightly protruding lower jaw. Females grow larger. During reproduction the ventral fins and mandible of the male are supposed to turn pink. I can't recall noticing that, although my fish were sexually mature and I did notice some mating attempts. What I do remember however is that when the females were not in the mood for reproduction activities, they would evaded the clasp by quickly swimming away from the male and sharply turn around, creating a head to head situation (as can be seen with Cichlids and kissing Gouramis for instance) where the male was simply pushed away. This happened several times in these years, so I take it this wasn't done accidentally. I have also been wondering about its common name. I found out that cocosoda is a Vietnamese soft drink, which didn't make any sense (it's the wrong continent to start with). A fish with a wide distribution must have more common names and a look at the FishBase common names section proves so. I will not bother you with Brazilian, Venezuelan or Surinam names. Coco (or Koko) soda is the common name from French Guyana. It turns out that more Auchenipteridae species are called Coco/Koko locally. For what it is worth: this (Creole) French word translates as little man (amongst others, but the most appropriate translation in my opinion). I wasn't able to do something with the “soda” part. I was thinking that it should have something to do with salt or brackish (as opposed to the Coco eau douce, which translates into Coco fresh water), but that is mere guessing as I can't find any proof. The common name Yellow catfish is highly inappropriate. Perhaps the nodosus has a yellow glow in the wild — which can be observed in many more wild caught fishes — but if I had told anyone that a blue grey woodcat was called yellow catfish I think they would have thought I was colour blind. 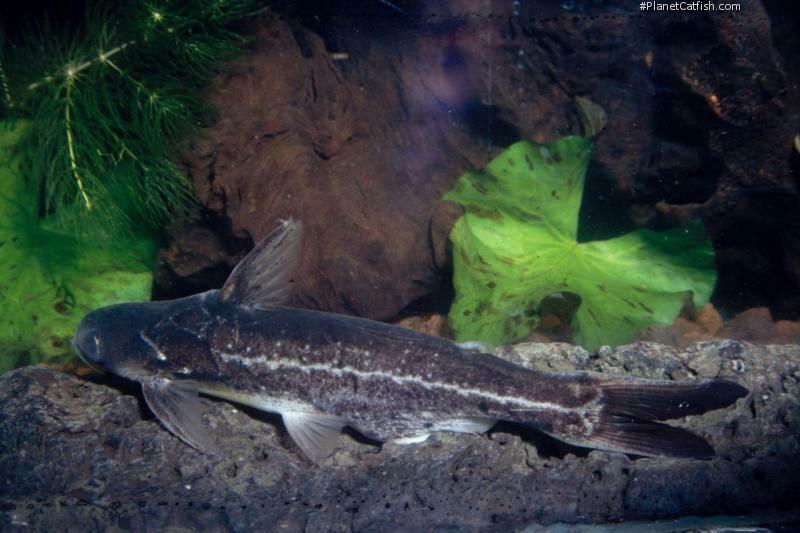 To end this CotM: Pseudauchenipterus nodosus is a very rewarding catfish. I hope it'll be imported again sooner or later so more people could enjoy it. Count me in! Picture of adult male specimen courtesy of Mr. Ruud Wildekamp, well known Dutch Killi fish expert and photographer. Type Locality Tranquebar [actually South America]. Etymology From the Greek pseudes meaning false, auchenos, meaning neck and pteron, meaning fin; in essence, a false Auchenipterus. Latin nodosus, from nodus meaning having numerous or conspicuous protuberances presumably in reference to the fishes conspicuous barbels. Identification A slender species with rather long barbels for an Auchenipterid. The forked caudal fin is jet black. The snout is very rounded with a terminal mouth.P. nodosus has a complete lateral line with zig-zags. Mees (Zoologische Verhandelingen No. 132, 1974) states the colour of the tail fades or even disappears as the fish grows larger although this has been contradicted by at least some individuals grown up to to 18cm that had their caudal fin remain black. Sexing Adult males have a genital papilla, are much more slender than females and have a slightly protruding lower jaw. Females grow larger. General Remarks A fish that is rarely imported, which is a shame as it is rather active during the day and displays an interesting colour pattern. Distribution South America. Lower reaches of rivers and into estuaries from Venezuela to Brazil. Other Parameters This species is adapted to life in brackish water (presumably even salt water) but does very well in fresh water too. A strong current is recommended. Feeding All prepared and frozen foods are greedily taken. Juveniles take their food from the bottom, whereas adolescents and adults obtain theirs mainly from the surface. Furniture Some hiding places and lots of swimming space. Compatibility This species will not harass other fishes, but it is a strong competitor for food. One must see to it that other fishes get sufficient food when accompanied by auchenipterids. Suggested Tankmates This species dislikes being kept with aggressive fishes. Avoid fishes that are too small and risk being eaten by 'accident'. Breeding Unreported, but for certain by means of internal fertilization. During reproduction the ventral fins and mandible turn pink.